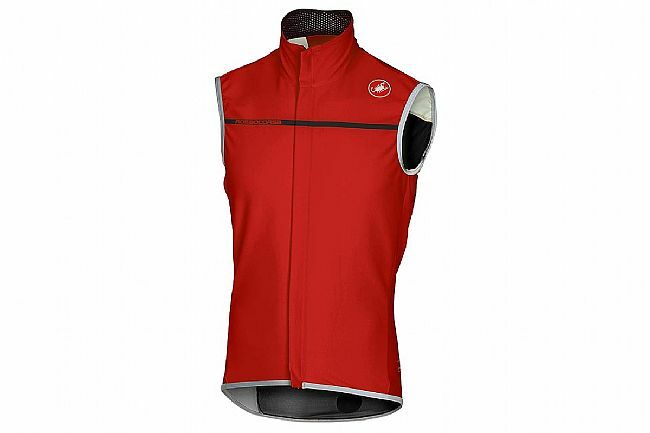 The Castelli Men's Perfetto Vest uses their Fawesome Vest as a launching point and further refines the fit and features for premium protection and comfort. 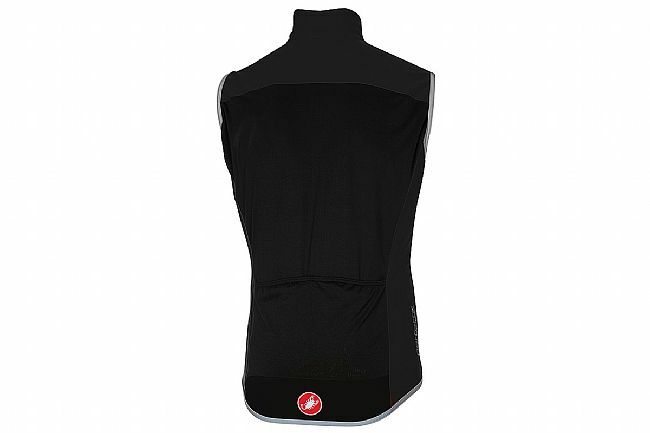 Gore® Windstopper™ X-Lite Plus fabric on the front and shoulders blocks out blustery weather, and the Nano Flex Light back panel keeps rain and wheel spray from soaking through while also ensuring the Perfetto vest is easily packable into a jersey pocket. It also includes two rear pockets of its own for additional storage and convenience. Full-length YKK® Vislon zipper. Reflective accents increase visibility in low light. Available in multiple colors. The Vest Ive been Looking for. I paired the Perfetto vest with the Puro 3 Jersey FZ for a five mile descent in temps from the low to mid 40s. Core stayed warm and was protected from wind chill by the Perfetto vest. 58 170 and a size L fits snug but comfortable and didnt feel constricting . Its definitely a race cut fit. Absolutely no fabric flapping around. Very pleased with the performance. Score another one for Castelli. This is the perfect springfall vest. Worn over a thermal jersey and winter base layer, it keeps me warm down to the low 30's. Worn with short sleeve jersey & arm warmers, good for riding in the 40's to lower 50's Good rain resistance, too. Packs down small enough to fit in a jersey pocket when it warms up. This is one of my most used pieces of kit. A little expensive, but it's well worth it. I normally wear a size Large jerseyjacket, and I got the Extra Large as recommended. 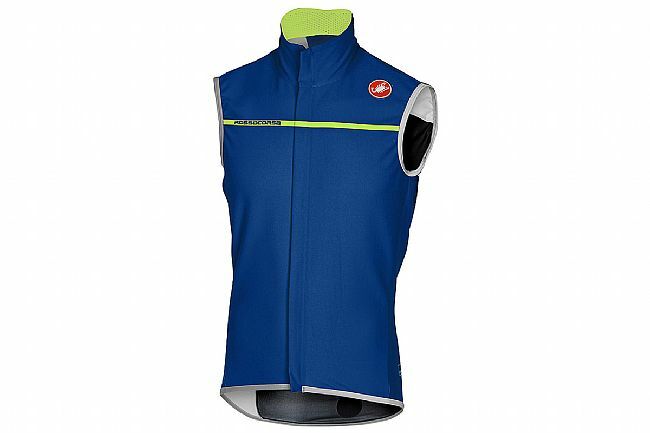 The Perfetto vest was fantastic to use when the the weather was in the upper 30s to upper 50s. The fit around the arm is a bit tight, but it prevented wind to go in and make the vest flap around like a typical rain vest. Ordered an XXL and sent it back. It was no more than a medium. I have a full complement of Castelli winter clothing because it is the best I have ever used for riding in really cold wet weather. And this vest fits right into that 'top of the class' designation. It's fit is exemplary, with no looseness or flapping. It's front blocks wind almost entirely, and has a good bit of insulating capability. The back is a good stretch material, but with good breathability to keep you from drowning in your own sweat. I typically wear it with other Castelli waterproof jerseys, so it is just the perfect addition for when the weather is particularly awful. And I got it in the fluorescent yellow color so I have at least a little less likelihood of being overlooked by motorists. Trully perfect. Fits very snug, great for any weather ranging from 40 to 65 degrees. The wind proof aspect is the best part of this vest. Has 2 nice larger pockets on the back. Great details, the logo patch is sewn on, heavy quality zipper. Good looking, high quality jersey for cold days and cool mornings. Very nice vest. It looks good and fits well (I'm 5'7 and 159 pounds. Taking the advice of another reviewer I bought a Large which fits snugly over a thermal jersey and base layer). The jersey appears to be of the highest quality. So far I've mainly used it as an extra layer on cold days and cool mornings and it has worked well in that capacity. When the temperature gets too warm it easily rolls up to fit in a jersey pocket. Taking advantage of a sale at biketiresdirect I was able to purchase the vest for a reasonable price. I'd recommend it to other cyclists without hesitation. Very warm and beautifully made vest. Classic Castelli. Beautifully made and perfect for cooler rides. Size is very much a race fit. 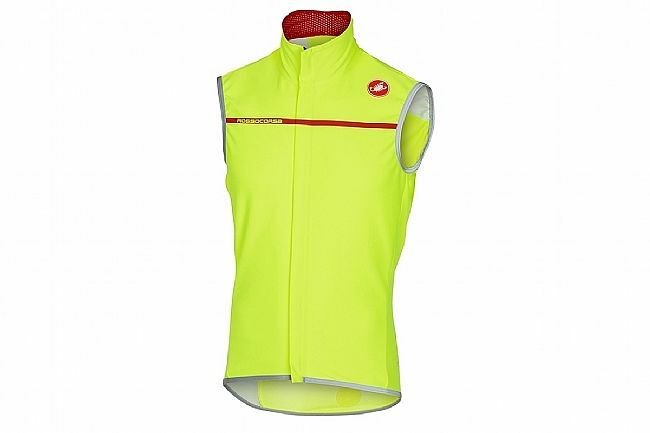 I sized up as I usually do for Castelli jerseys and this vest is almost a compression fit for me. Very windproof, good water repellency but not very warm. Wind blocking is great, ability to keep you dry is good in light rain but it doesn't provide much insulation. Seriously, the Fawsome vest gets so much use. It's snug, warm, and packable. This is the vest you've been looking for. It's thicker than your typical windbreaker vest so I use this in the winter on days below 45 degrees. I end up wearing it under my Gabba 2 Jersey simply because it drives me crazy that the vest doesn't have rear pickets. With winter gloves on, it's a wrestling match to get anything out of my jersey pockets if I wear it on the outside. If it had rear pockets, I'd give it 5 stars. I also wish the back of the vest was the same Yellow Flou as the rest of it. It doesn't make sense to me from a visibility standpoint that it has black on the back - especially on winter rides when fog, rain, and darker conditions are likely. Like most Castelli gear, it runs small. The size small fits like a glove on me.